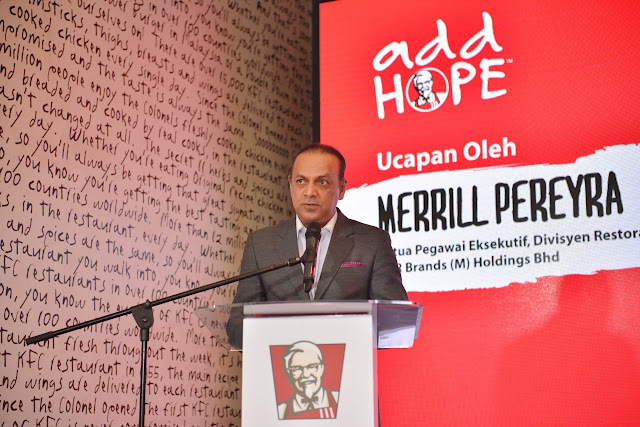 KFC Malaysia continues its efforts to help end hunger with their Add Hope 2017 campaign. 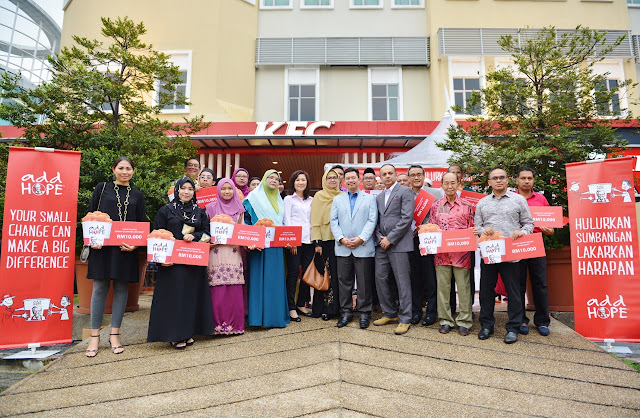 An on-going initiative running in its 11th year, this local instalment of KFC’s global corporate social responsibility initiative is driven to gather greater support and awareness from the public and to raise funds for the cause. In the spirit of giving and spreading good deeds during Ramadan, Add Hope 2017 was launched during the holy month, reinforcing the plight of hunger in the less fortunate community. The campaign’s aim to garner greater awareness and participation this year resulted in a webpage dedicated to spread the word of this cause further and to allow a convenient channel of donation online at kfc.com.my. “While Add Hope is a year-long effort that goes beyond the fundraising period, donations to support this cause are an important part of the campaign as these funds allow us to provide much needed food resources to those in need. We are encouraged by the positive support we receive from the public year after year. This allows us to help more people and do more for the cause,” said Merrill Pereyra, CEO - Restaurant Division, QSR Brands (M) Holdings Bhd. Add Hope programme as well as videos on social media to help spread the word. As with previous years, Add Hope will continue to raise funds through the ‘Add Hope Meal’ promotion. Meals under this promotion will be charged an extra RM0.50 which goes directly into the fund. At the same time Add Hope donation boxes are conveniently placed at cashier counters in KFC outlets throughout Malaysia for customers who prefer to donate in this manner. Add Hope 2017 marks the third year Scha Alyahya, popular actress and TV host, has joined KFC Malaysia as the spokesperson for this noble effort. “This cause is very close to my heart especially after two years of being involved in this meaningful journey with KFC Malaysia. Add Hope has given me the opportunity to meet with many underprivileged individuals and families and better understand the reality of the living conditions of some of our fellow Malaysians. It has been such a humbling experience and has driven me to do every bit I can to help. We need continuous support from Malaysians to continue to bring relief and help to those in need. Your small change can make a big difference,” said Scha Alyahya. Add Hope’s main objective is to raise funds in order to provide food resources in hunger stricken areas both nationally and internationally. A portion of the funds will be allocated for the United Nations’ World Food Programme while the majority will be distributed locally to needy families and charity homes throughout Malaysia. In addition, funds have also been channelled through collaborative efforts with local NGOs and relevant government bodies including the Malaysian Welfare Department, PERTIWI and KECHARA soup kitchen, Food Aid Foundation, Yayasan Chow Kit (YCK), Hope Worldwide Malaysia, Malaysian Red Crescent Community Services – JB (MRC), and Yayasan Orang Kurang Upaya Kelantan (YOKUK). To date the campaign has raised more than RM21.3 million locally, and more than USD$600 million globally. This year’s Add Hope campaign starts on 15 June 2017. Further information is available at kfc.com.my or visit Add Hope Malaysia’s Facebook page, www.facebook.com/AddHopeMalaysia.